It’s a rare day that I post twice on this blog, but today I did a ‘ride’ because I wasn’t healthy enough to ‘train’. Translation: I got to stop and take some photos. Shoko needed to go to Marseille today to do some filming for her school, so I decided to take advantage of my new bike carrier (the Ford Focus) and drive her down there, so I could get to ride some new roads. Here is the starting gate – Le Vieux Port. There’s a bus lane the whole way round, so very nice and stress free to ride. 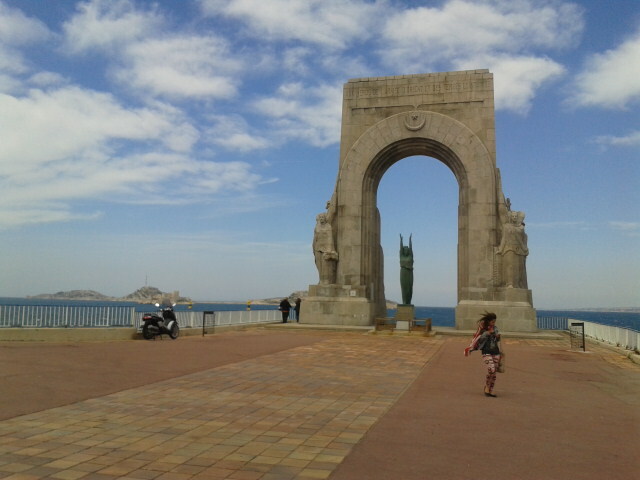 A monument to French soldiers killed in North Africa during WWI, I think. The monument to dead North Africans must be nearby…I guess I missed it. Notice the wind-blown girl. It was howling today. 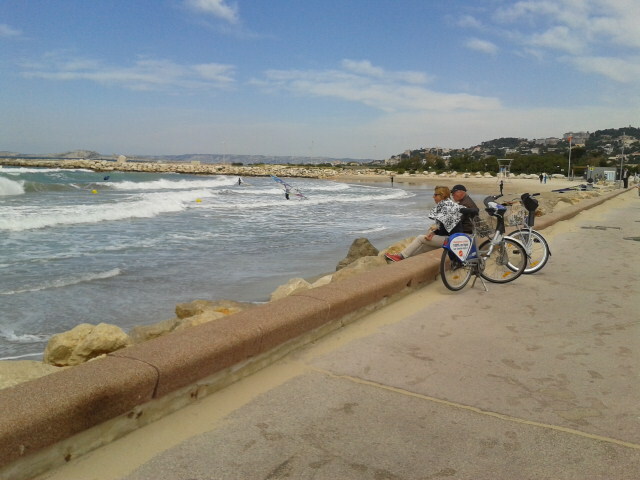 A couple of locals along La Corniche, taking advantage of Marseille’s bike share program – Le Vélo. More wind evidence, at The Beaches. Now that I see the photo it doesn’t look that odd, but when I was there it seemed to me that the height of the wall directly in front of this bench was just around ‘eye’. The right sentiment was there, but something was lacking in the execution. Maybe it’s reserved for tall people. As I left La Corniche the city evaporated slowly and I was left with a windy, barren coastline. Till I finally reached the end of the road, at the extremely squeezed hamlet of Callelongue. 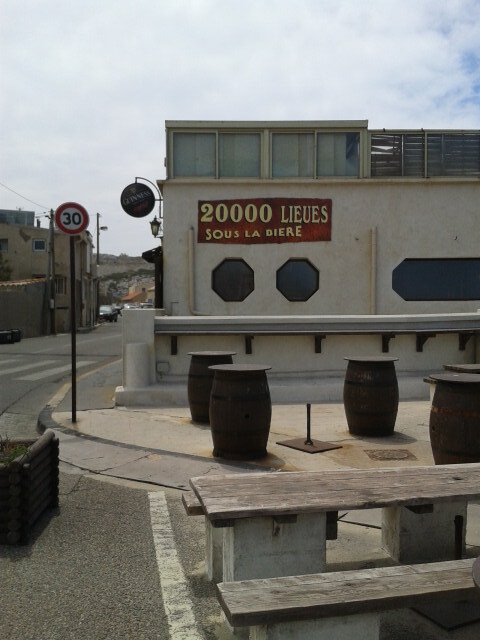 On the way back I was tempted by this place – “20,000 Leagues Under the Beer”, not only because I love beer, but also because I can’t fathom the joke and would like to know what I’m missing. Nearing my start point I turned to the right as I was crossing a bridge and nearly missed this little jewel. What appears to be a small, Mediterranean fishing village is actually close to the heart of France’s 2nd (or 3rd, depending on who you ask) largest city. 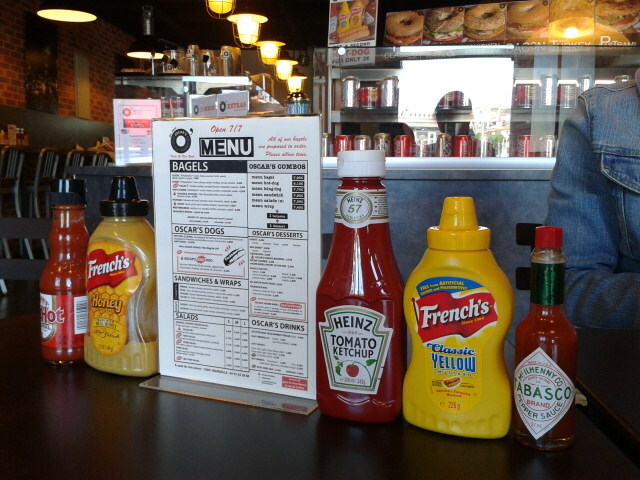 We tend to go ‘exotic’ with food when we hit the big city and today was no exception. Oscar’s Bagels and Sandwiches serves up some very decent bagel sandwiches, has coffee in cups big enough to wrap more than a finger and thumb around, AND they let you keep your bike inside while you eat! I just finished reading Izzo’s “Total Chaos,” set in Marseilles. The first of a trilogy. If you like noir mysteries, you might try it. Written in French, but I (lazy me) read in translation to English. There were a number of passages that I suspected something lost in translation, but not a big problem. I guess he was known as a food writer also. Your photos are gorgeous, as always. 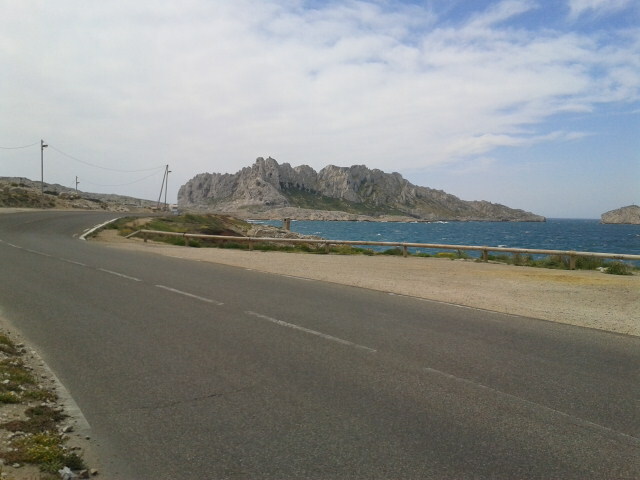 Have you ever ridden into or out of Marseilles to the north? And I guess the traffic wasn’t too bad since you didn’t mention it? It is high on my cities to visit, paired I think with the Alps. Be well, get healthy and I’m glad you had the strength to ride, if not train. I’ll have to check Izzo out, even if I’m not a big mystery fan. Marseille is well worth a visit this year. It is the European Capital of Culture this year, so lots happening and tons of new museums and such. The city is really starting to grow on us. Yes, I’ve ridden north back home – for my birthday this year, incidentally. I can’t believe I did a 100 mile ride and never wrote a blog article about it! Anyway, it wasn’t all that pleasant for the first part of the way, as you may be able to imagine, but really, not a big problem if you pick and choose your route carefully. South is much more pleasant. If you’d like to end your trip there this year I can happily advise on route choices to get you to the doorstep of the airport! Thanks! 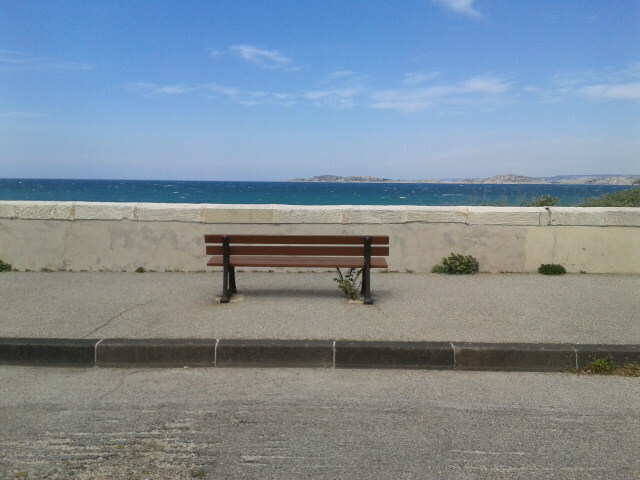 I will love to come to Marseilles, though mosr likey not this year. I think that other city starting with an M on the Mediterranean is more probable. And I do thank you for the offer of directions …be cautious what you say I (and more like me on this side of the Atlantic) will take you up on it!! Been following your blog for quite a while Gerry. Great pics and a prompt for me to visit Marseille when I come to Languedoc in July. Well worth a trip, in my opinion. It’s a much maligned city here in France, but I find it fascinating. 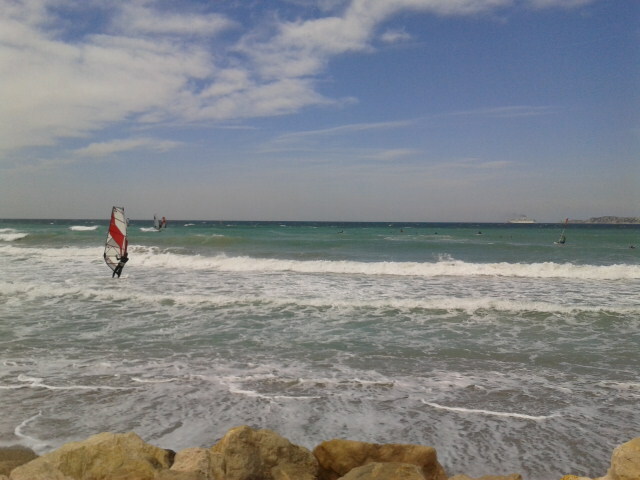 Nice pictures of the wind. I might steal one and claim it is my own as we have a ‘results of wind’ competition coming up. My vulgar mind turned to other possibilities but not so easy to photograph. Steal away, although I think you should at least give your first idea one good try. I’ve been following this blog for a long time now. Always been meaning to say, ‘Thanks’ because it keeps me motivated to go out and ride. 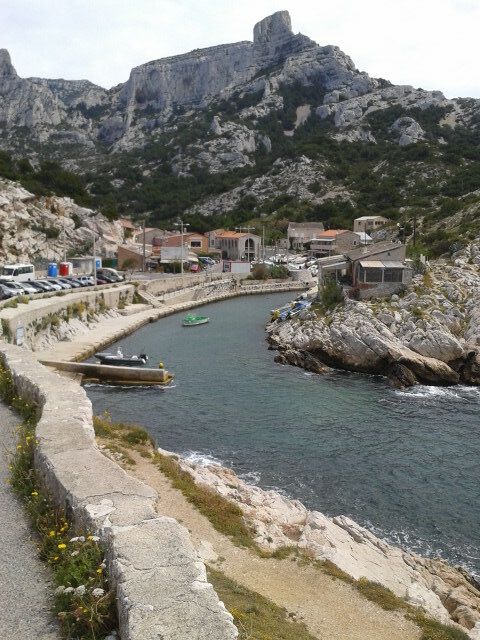 Some great pics of Marseille and a prompter for me to visit in July when I come to Oupia for a couple of weeks of cycling. “20000 lieues sous la bière”: it is actually a play on words (don’t know if it is the proper term in English) related to a famous French novel by Jules Verne, called “20000 lieues sous les mers”, where the heroes explore the oceans to try to find a mysterious monster, which ends being a giant submarine. Thanks, Anne. I got the Verne reference, but still don’t get the joke! It’s a rhyming pun. Mers=Biere. Oh, and ‘mers’ rhymes with ‘bieres’…? Merci! Posted twice – with additions! Duh. Post as many times as you want. It makes it look like I’m popular! Nice pics. Looks like the biggest traffic problem was avoiding the boats. There are so many times on a ride I’ve said this would make a great pic but just keep riding so nice to see you took time for us to enjoy. I do that all the time, Luc, trust me. The only reason I stopped yesterday was because I decided it was going to be the case. I think today might be the same, if I don’t get blown off the bike. Love the photos and the quirky stories you can generate,,,,,,we see the bike….. but we really want to see the bagel LOL…. Gary, the bagel didn’t last long enough for a photo! 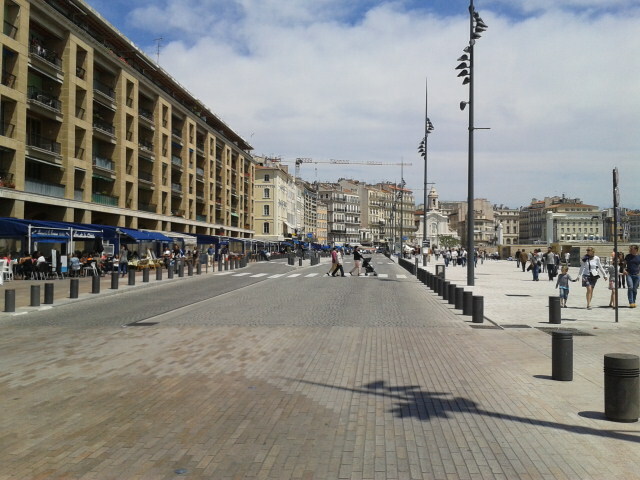 I’ve always wanted to visit Marseilles, and now I feel like I have. Thanks for sharing the pictures with us. 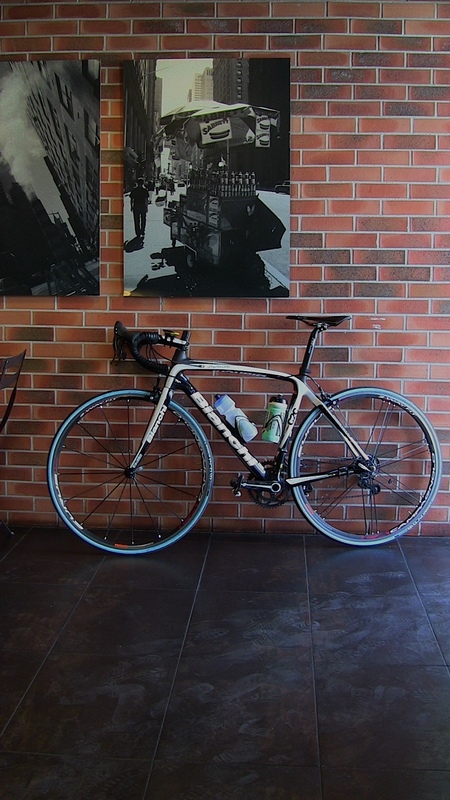 After riding around the city, I’m sure the bagel sandwich never tasted better. 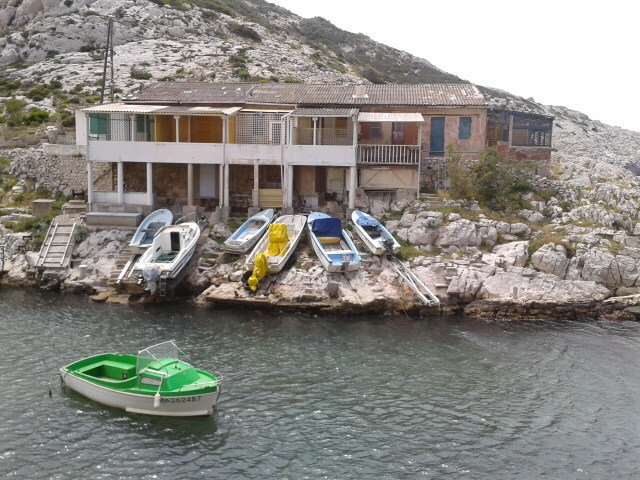 Marseille is a gritty town and much of it should not by cycled through (I know because I’ve cycled through those parts! ), but the coast was really nice. 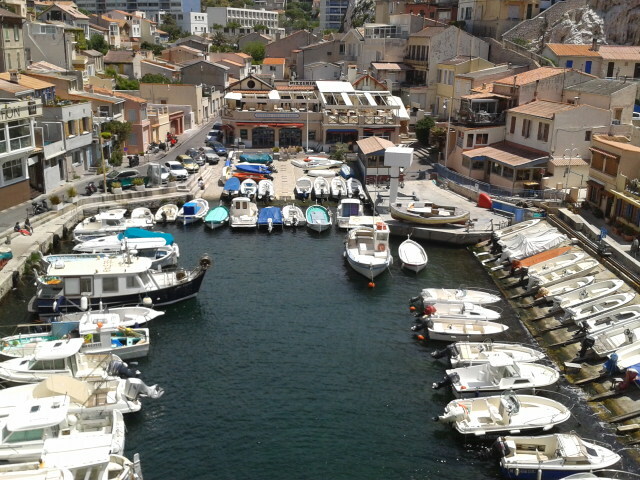 The next time I go down I’ll take the road to Cassis, a popular fishing village 20 or 30 km away. I think that’s coming soon because Shoko informs me she isn’t done filming there yet. Stay tuned! I’ve found that a lot of big cities are like that, only good for riding around the outskirts or certain parts. Looking forward to hearing about the fishing village. This was fun to read…and I learned stuff. Thanks!